#038 Questions & Answers #1 – Recorded Live! | That's In The Bible? « #037 Do You Have The Gift of Evangelism? #038 Questions & Answers #1 – Recorded Live! A special edition of That’s In The Bible? 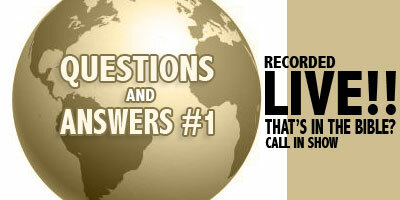 where we take your phone calls and chat room questions about the Bible live via Talkshoe. Are the Jews the true Christians? Does God command people to be tortured in II Samuel 12:31? How can the blood of a Jew over 2000 years ago make me right in the sight of God? Isn’t it the death of Christ that counts and not the blood? What are the 7 Spirits of God that are mentioned in Revelation? How does the King James Bible compare to the new translations like the NIV and others? Is the term “God the Son” correct to use? What must I do to be saved? Get baptized? This entry was posted on July 17, 2010 at 11:45 pm and is filed under That's In The Bible - Podcast. You can follow any responses to this entry through the RSS 2.0 feed. You can leave a response, or trackback from your own site.